What's in our Chinese Schezuan? 1. Stir-fry 2 cups of chopped vegetables like spring onions, carrots and capsicum/ green pepper until they are cooked by crunchy. Add paneer and stir for 1 minute. 2. 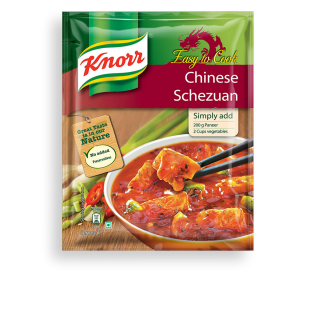 In a separate bowl mix the contents of Knorr® Easy to Cook Chinese Schezuan with 450 ml of water. Add this mixture to the vegetables and simmer until the sauce has thickened. 3. Add 200g of fried paneer to the sauce and cook for 1 minute. Garnish and serve hot!